Most people enjoyed BBQ's with friends and families, festivals, and of course, fireworks for Independence Day. This year we did things a little differently. We enjoyed the United States true beauty: out in nature. 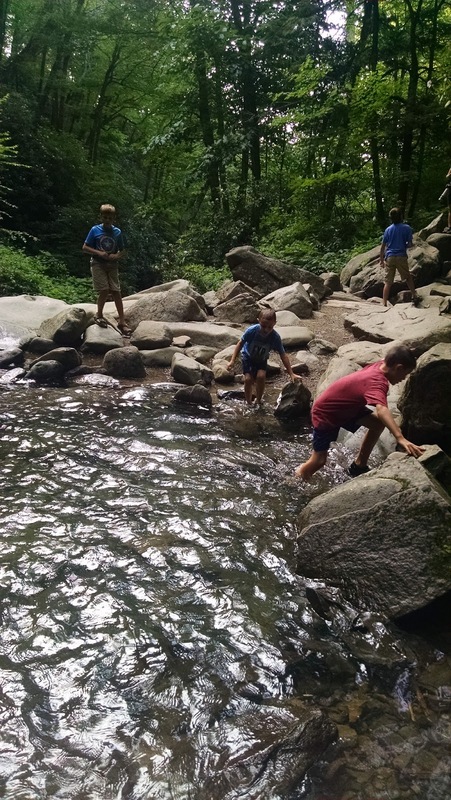 We hiked, swam in swimming holes and streams, drove, and climbed our way through Great Smoky Mountain National Park until sundown. 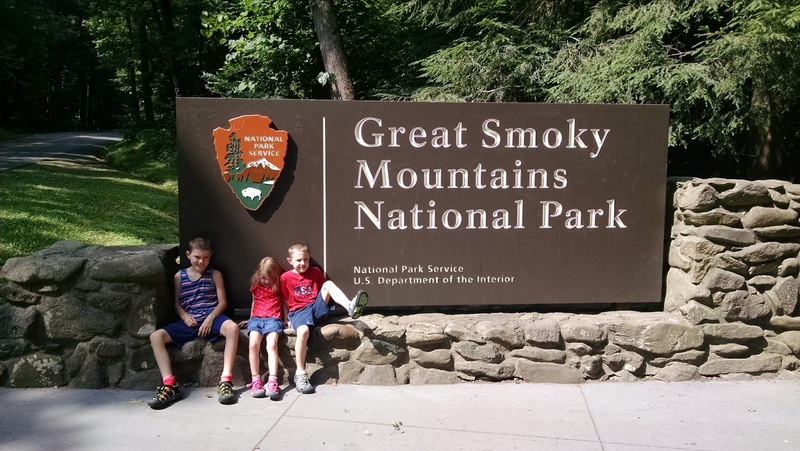 One of the reasons we chose this National Park to go to was because it was so family friendly and we were not disappointed one bit! It was a busy, somewhat tiring day, but it was also my favorite day of vacation. We began our morning a bit later than usual thanks to the midnight parade in downtown Gatlinburg (read about it in yesterday's post here). Hubs and I made a big breakfast for everyone, while the minis broke out their toys and soaked in the hot tub for a bit. Our cabin was so roomy and had so much to offer that the minis keep telling me they really miss our cabin...over a week after we left! After a big breakfast filled with plenty of protein to keep us fueled, off we went to Great Smoky Mountains National Park! Our cabin was just a few minutes from several of the entrances to the park. 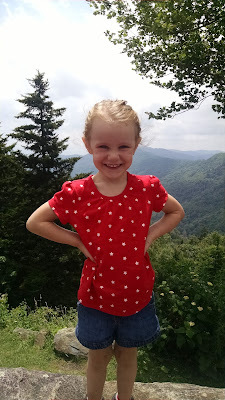 We chose to start with driving Newfound Gap Road. I must say that it was an excellent choice! Our first stop was a lookout point of Mt. 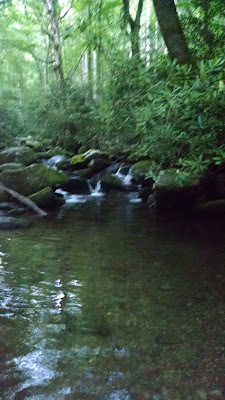 LeConte (highest peak in the Smokies). Absolutely gorgeous views! The minis were fairly good sports about so much picturing taking. They were not fans of getting in and out of the van at various look out points, so we tried to keep those to a minimum. 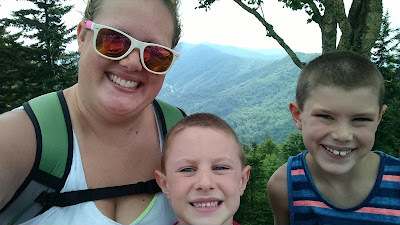 The one hike we really wanted to do, but didn't think the minis could make it was Chimney Tops. We had such a great time on this trip that we plan on going back in a few years. We're well aware that it will likely be a completely different trip with much more difficult/longer hikes, including this one. 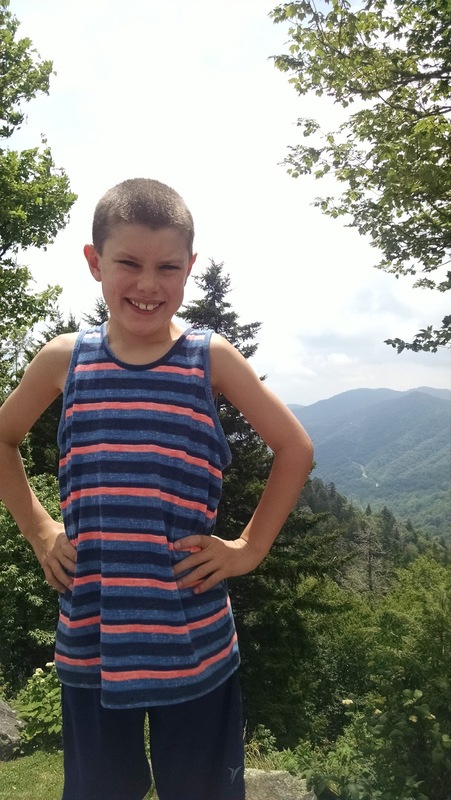 Our first big stop and big hike of the day was along Newfound Gap road, where the road crosses from Tennessee to North Carolina. We mostly stopped because the area had bathrooms plus access to the Appalachian Trail. The views that we took in was icing on the cake! 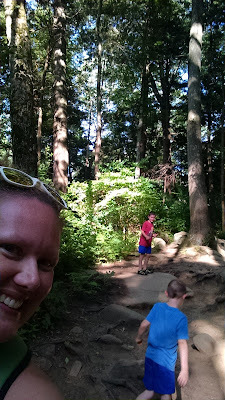 There were so many great trails and access points here too! The kids loved walking to the top and looking down at everything. 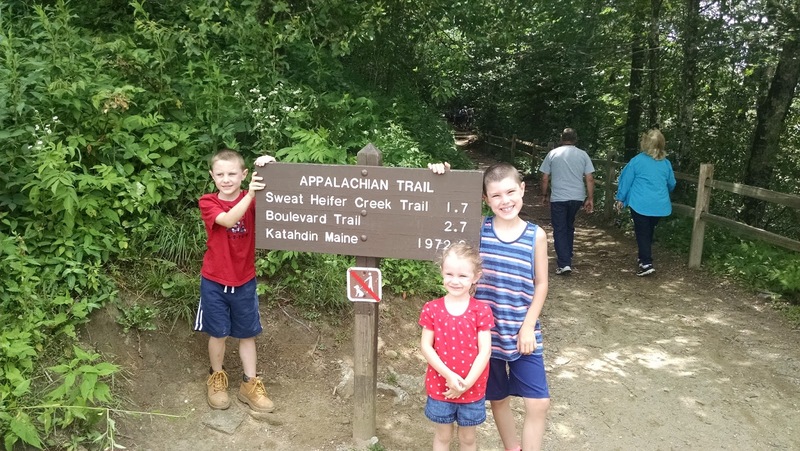 The Appalachian Trail was technically our first real hike of the day and it was amazing! It was tough (there was climbing, drop offs to watch out for, and the trail was really crowded), but the minis did incredible. A lot of people started out on the trail, just to say they had walked on the Appalachian Trail. As soon as the steep trail got difficult, many people turned around. But not my kids! They got excited the more difficult things got and we were one of the few groups who kept going...at the minis urging. I'm very proud of them. All of those lectures and learning about hiking rules and manners paid off. This girl had me applauding and laughing. She kept right on marching and did everything her oldest brother did. She may only be 4 years old and 32 lbs. 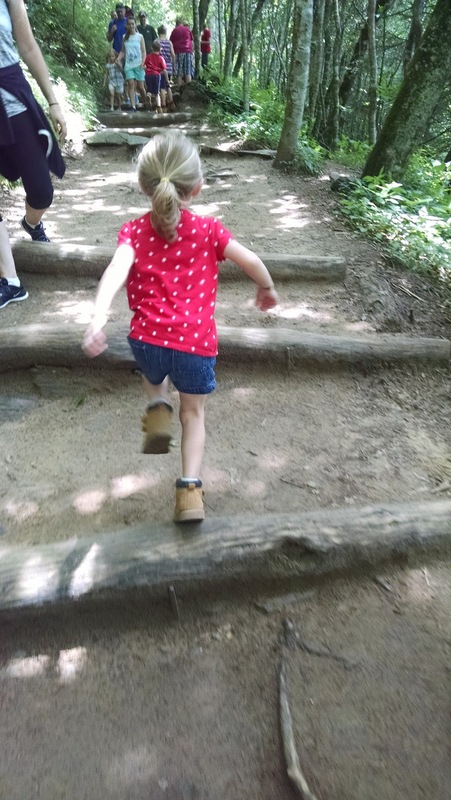 but she kept every adult on the trail amazed. We only hiked a mile so it didn't take us too long. 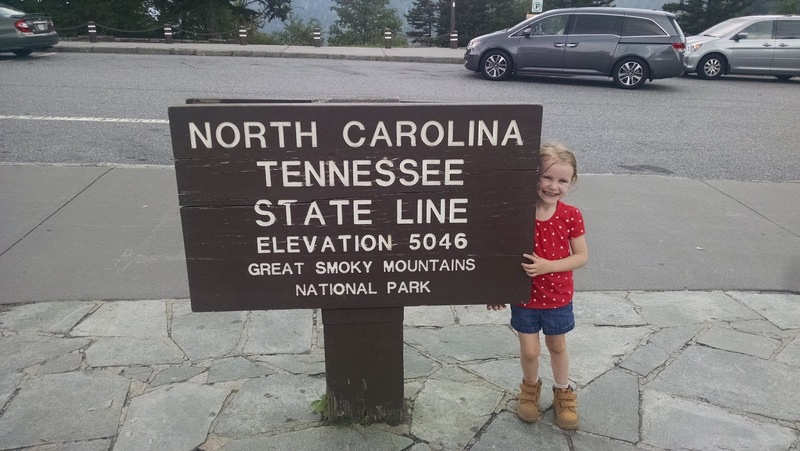 We stopped at the TN and NC state line, then drove to Clingman's Dome. On the way to Clingman's Dome we broke into our lunch: protein bars, bananas, apples, Gatorades, and carrots. As I had mentioned before, I underestimated the driving time through the mountains. I had imagined us being back at the cabin for lunch, but between the traffic (there was A LOT of traffic everywhere we drove throughout the week. We discovered this was the busiest travel week not just for the Smoky Mountain area, but for all of the U.S.) and the winding roads, I was happy I packed plenty of snacks that were able to be eaten in place of lunch. We bought several boxes of Luna Protein and Cliff bars during our grocery shopping the day before. We figured they'd come in handy for all of our hiking and outdoor activities. Where oh where to start with Clingmans Dome?? First of all, beautiful views. When it's clear. It's not always clear. 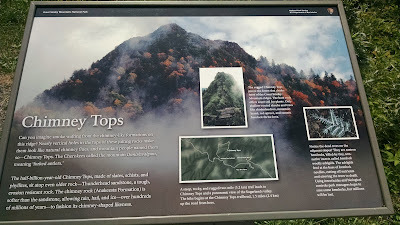 Second of all, it's the highest point in the Smoky Mountains. The hike is only a mile but it is straight up. Walking on a paved trail makes no difference when it's straight up. Thirdly, the traffic. Good god the traffic. We sat at a standstill for nearly forty minutes before snagging a parking spot (still quite a ways away). It was sunny when we got out of the car and the weather hot. Although I wasn't gunhoe about this hike (it was Hubs idea) I was excited to see the beautiful views Clingmans promised. 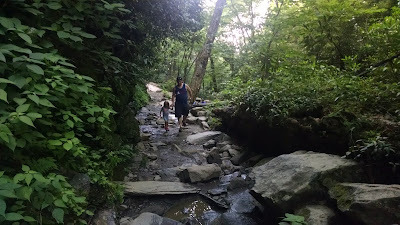 The trail is straight up to the highest point in all of the Smoky Mountains. We all instantly felt the change in the atmosphere. This was the toughest hike I had ever done in my life. 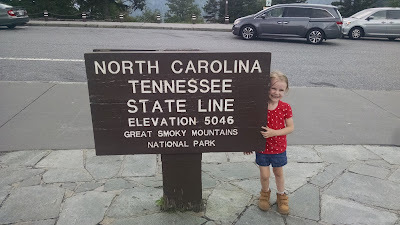 We found out afterwards that there was a non-paved trail that made it's way to Clingmans Dome that was longer (just over 3 miles round trip) but went up gradually. I think we may have had better luck taking that trail than the straight up paved trail. Also by this point, the minis were done with our picture taking. The higher we got on the trail, the thicker the cloud covered became. We actually walked through the clouds! The minis pretended to eat some as a snack as we walked through. It took us an hour to hike one mile but we made it to Clingmans Dome.....and there was too much cloud cover to see any views. We were all exhausted by this point as well. The walk back down was much easier but there were a few tears shed. 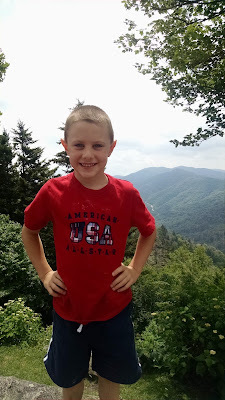 After a stop in the gift shop, we left Clingmans Dome tired, out of breath, and ready for a break. We drove back to the cabin to make dinner and rest a bit. Elizabeth was very distraught on the drive back to the cabin because "my toe is going to fall off! There's something wrong with it. I think a bug got in my skin." She got her first blister. It was gone by morning. Lounging on the couch never felt so good after that hike. The lower level of our cabin had a cozy family room and a huge jacuzzi. We spent plenty of time in the family room area. 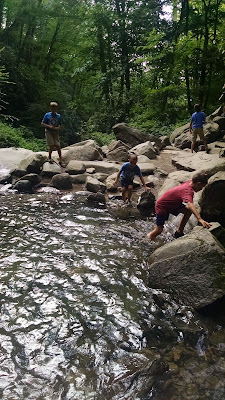 We recharged after Clingmans with an early dinner, veggies, tons of water, and then we were back out hiking. 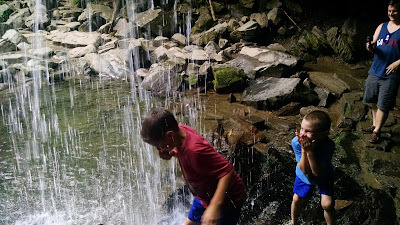 Our next hike was my favorite: Grotto Falls. The drive to the trail head was all throughout the mountain floor. It was deeply wooded and deeply gorgeous. 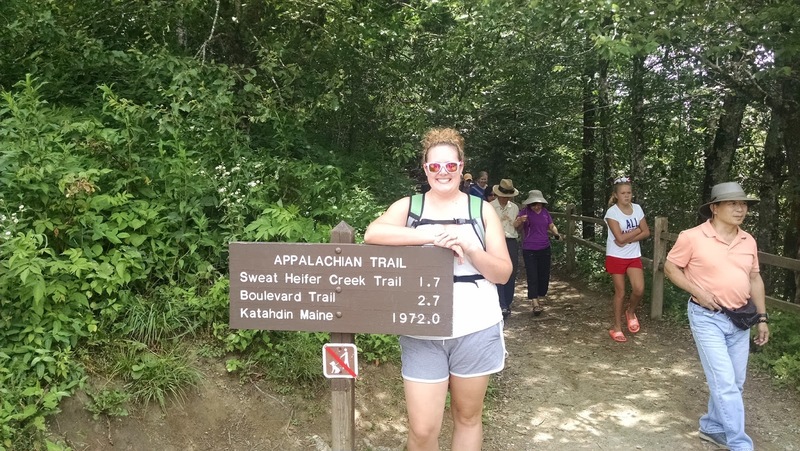 I did lengthy research on hiking trails in the months leading up to the trip. I knew which ones to avoid (too hard or long for the kids to do) and which ones were appropriate for their ages. 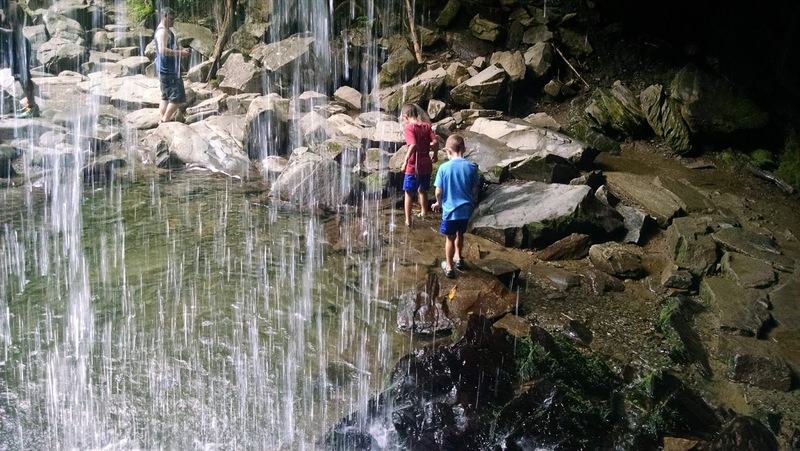 There are several waterfall hikes in the National Park but only a few the kids could do. 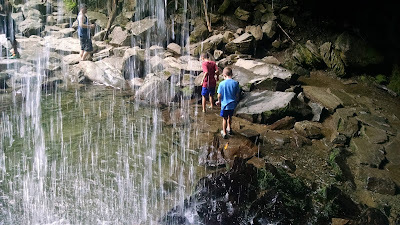 We chose Grotto Falls because it was only 3 miles round trip and you could walk behind/around the waterfall itself. 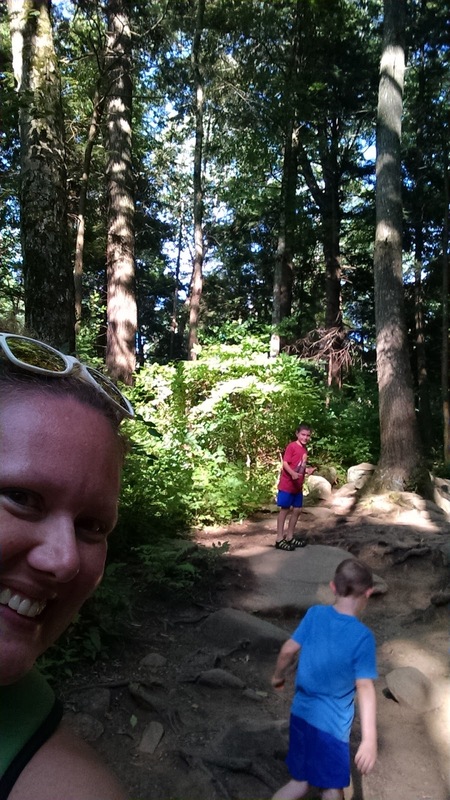 The minis (and Hubs and I) did the trail with ease. The only thing that worried me were a few steep drop offs along a good portion of the trail and the sun going down. Since we did the trail in the evening, we moved the minis along so we didn't get caught on the trail after dark! The trail was laden with cool looking tree roots. We did have to watch out to not trip on them. 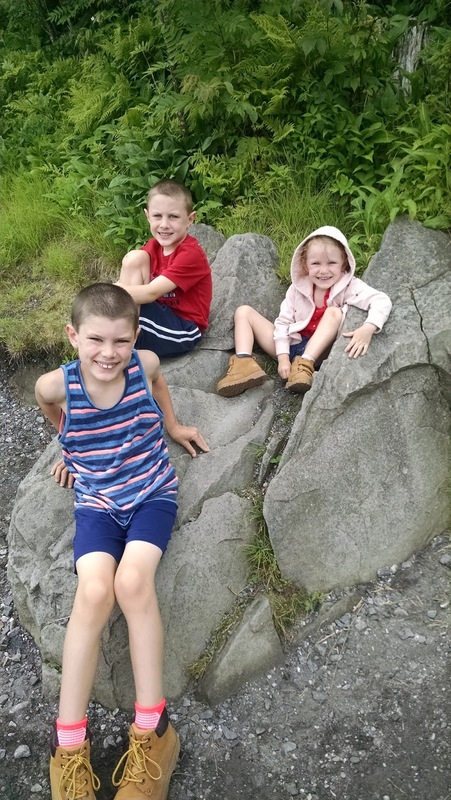 We wore our Keens for this hike since we were going in the water. I think hiking boots would have been more effective on this trail instead of the Keens (although the Keens came in very handy at the waterfall and wading in the water hole). These were all around the trail. Grotto Falls had outstanding views of the mountain floor! 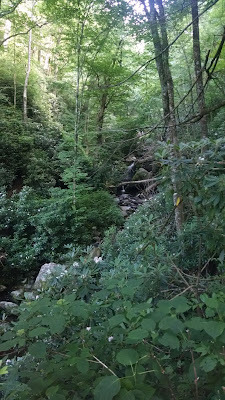 The things we saw on the trail: snakes, a mouse, a snail, salamanders (did you know the Smokies has more species of salamanders than anywhere in the world?? Oh the little things you learn at visitor centers and from Park Rangers) and we definitely heard grunting noises from the thick woods. It was so rewarding to get the falls and take a dip. We swam in more rivers, streams, and swimming holes in three days than I have in my entire life! Elizabeth was scared of the waterfall and refused to touch the water. 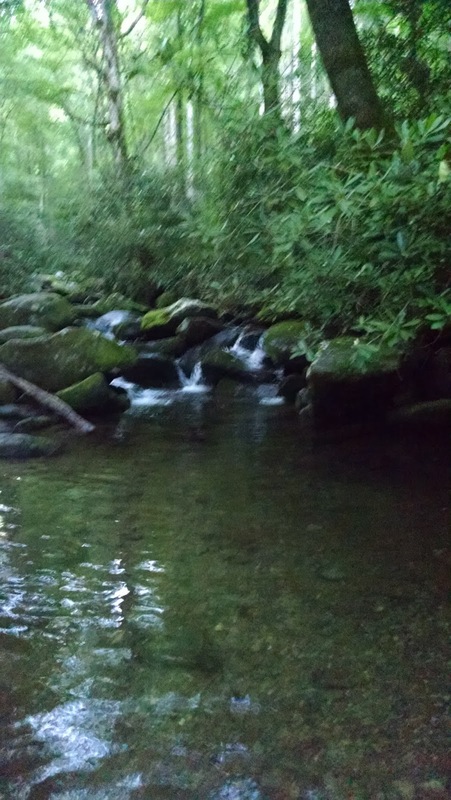 Sitting on a log in the middle of the lower part of the waterfall. Right there to make sure they didn't fall off. Thumbs up for safety. We made it back to the trail head just as the sun began going down. It was much darker on the mountain floor, where trees provide so much cover you can hardly see the sun in the middle of the day. 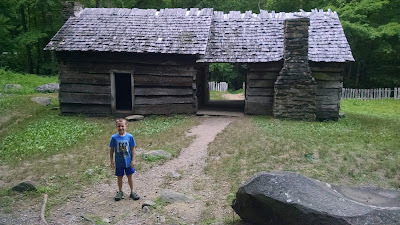 I was really happy and excited to come across all of the old mountain buildings (as a Park Ranger told us "from the first mountain people in the Appalachians"). From my readings, I had thought all of the historical buildings were only accessible by long hikes; too long for the kids. Not only did we happen upon these and explore them, but we got to explore an entire mountain town the next time (that post will be up soon). Max was not in a good mood and had a meltdown. There were very few meltdowns during our road trip, which is nothing short of a miracle considering we were gone for nine days; meaning we were completely off of their schedule for nine days. Harrison found another stream he just had to swim in. Elizabeth tagged along too. We didn't stay long because it was almost dark and we were the only ones around. It started to get a bit too eerie for me. We ended our night with showers (seriously the best shower of my life) and fell into bed. The sights, sounds, and movements of the day wore all of us out. I was a bit surprised that none of us were sore from all of the climbing. We decided to skip fireworks downtown that night because we had had a very long day. Typically we would all be disappointed, but I don't think one of us felt like we were missing anything after all we had seen and done in twelve hours. 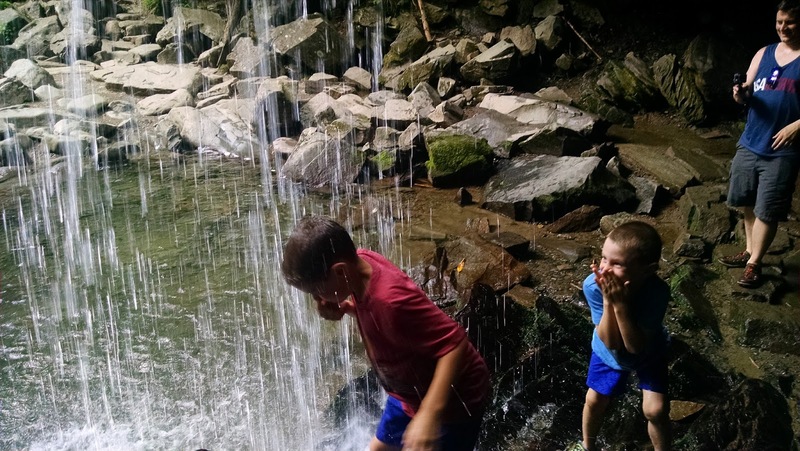 One of the most surprising thing in the Smokies was the humidity. 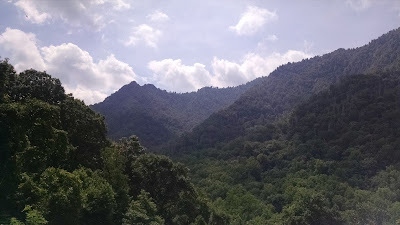 As we learned from our White Water Rafting guide, the Smoky Mountains are actually a temperate forest, which means it has just as much humidity as the Amazon Rain Forest. How crazy is that??? Before we left, I took a gander at the forecast for Gatlinburg. I noticed the evenings called for cool temperatures, low 60's. 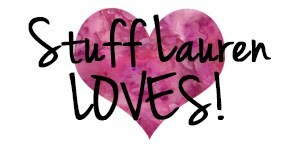 I packed leggings, sweats, and jeans for our night time adventures thinking for sure they'd be used. Boy was I wrong. 60 degrees in the Smoky Mountains feels like high 80's in Iowa. The humidity is always there, morning, noon, and night. Surprisingly, none of us found the humidity or the temperature difference uncomfortable. 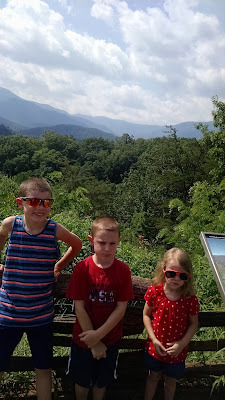 If I had to re-do this day, I would have not done Clingmans Dome and attempted to do Chimney Tops, yes even with the kids. 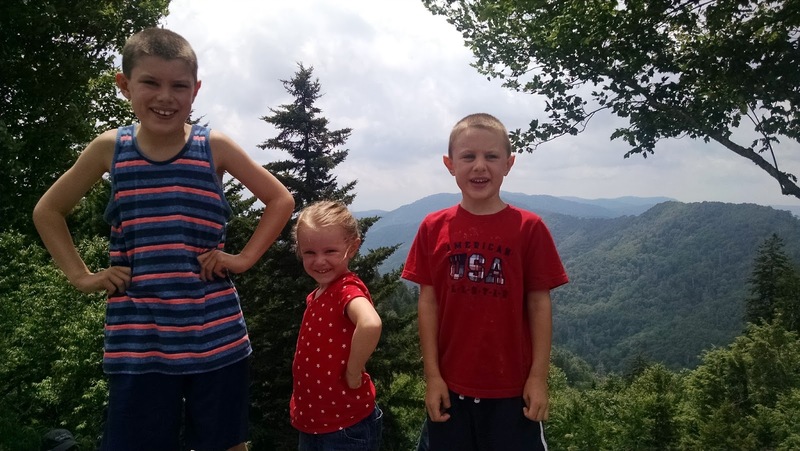 Clingmans Dome wound up being incredibly difficult (how come I didn't read about that anywhere???) because it went straight up. Chimney Tops is strenuous but it's not near as tall as Clingmans and climbs up for two miles instead of one. I also would leave more time for driving. 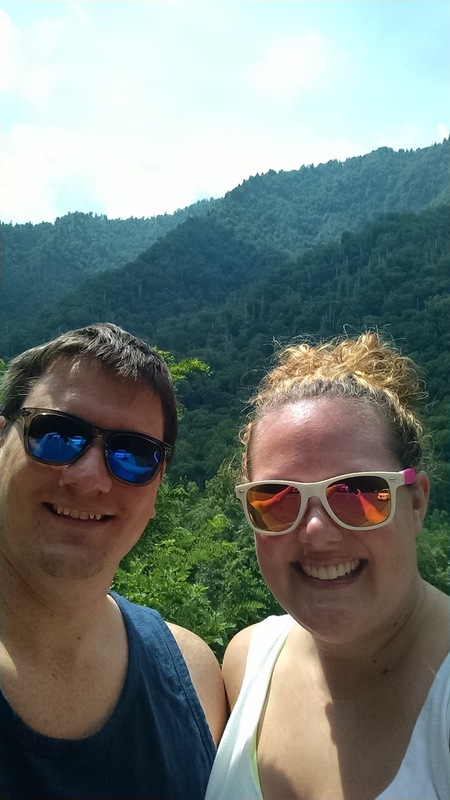 The traffic along Newfound Gap Road was heavy and took a lot of time. 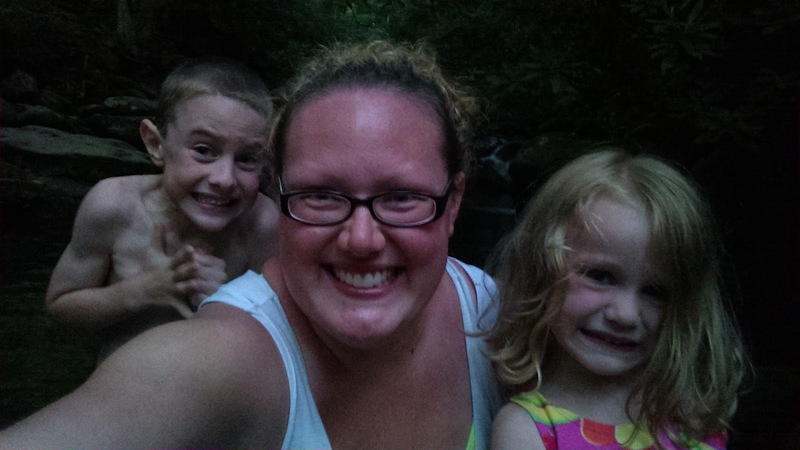 The next adventure to come on the blog.....White Water Rafting Day and going on an actual bear hunt (but I mean, not to actually hunt them).